Thomas Quinn Jones was born on the 19th August 1978, in Big Stone Gap, Virginia USA, and is a retired American Football player, who played for 12 seasons in the NFL for teams such as the Arizona Cardinals, Tampa Bay Buccaneers, Kansas City Chiefs and New York Jets. He played in the position of a rusher, and reached the mark of more than 10,000 rushing yards, which has been achieved by only 25 players in the history of the NFL. Have you ever wondered how rich Thomas Jones is, as of mid-2016? 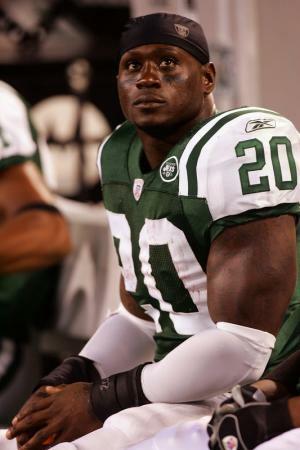 According to sources, it has been estimated that Thomas Jones` net worth is as high as $12 million, an amount mostly earned through his successful career as a football players, however, after he retired, he tried himself as an actor, which has also added to his net worth. Thomas grew up in a family of seven children, one of his siblings is Julius Jones, who was a running back who also played in the NFL. Thomas` mother worked in a coal mine, and at home, his father taught him and his brothers and sister how to read, and to help with house chores. When it comes to his education, Thomas attended Powell Valley High School, and while there began to play football. During his four years, he became one of the best players in the school`s history; he holds the record of most rushing yards in a season with 3,319, and won two championships with his high school, in 1994 and 1995. After matriculation, Thomas enrolled at the University of Virginia, where he continued playing football. Until college graduation he played for the Virginia Cavaliers, and with success. He set several team and conference records, including the all-time rushing leader of the Cavaliers with 3,998 yards. After graduation in 1999, he decided to enter the 2000 NFL Draft, and was selected as the 7th pick by the Arizona Cardinals. However, he stayed in Arizona for only three seasons, before he was traded to the Tampa Bay Buccaneers. While at Arizona, Thomas recorded 1,264 yards, and nine touchdowns in 39 games. It wasn`t any better in Tampa, as he stayed only one season and had 627 yard and three touchdowns, however, the following season he became a free agent and joined the Chicago Bears, which increased further his net worth, but his game numbers began to improve. In his first season, Thomas recorded 948 yards and seven touchdowns, and in the second season, for the first time he passed the 1,000 mark with 1,335 yards, and added nine touchdowns. He continued successfully, and in the following season he had 1,210 yard and six touchdowns. After the season ended, he was traded to the New York Jets, and immediately signed a contract worth $25 million over three years, which also increased his net worth. Nothing changed in Thomas` performance, as he again had more than 1,000 yards in the season, this time stopping at 1,119, but he only had one touchdown. After the 2009 season, Thomas was released by the Jets, despite having 1,402 yards and 14 touchdowns, making it his best season in the NFL. He then signed a contract with the Kansas City Chiefs worth $5 million over two years, increasing further his net worth. After this contract expired, Thomas decided to retire from football, and to pursue a career as an actor. So far, he has appeared in several TV series and films, including “Shameless” (2013), “Runaway Island” (2015), “Being Marry Jane” (2015), and he will appear in films “Corbin Nash”, “Addicted to You” and “Andover”, which are yet to be released as of mid-2016. Regarding his personal life, there is no information in the media, apart from that he has dated actress Meagan Good in the past. Thomas is also active on several social networks, including Twitter, where he has a great number of followers. 1 Eligible for Pro Football Hall of Fame in 2017. 2 One of the 25 all-time leading rushers in NFL history with more than 10,000 rushing yards. 3 CEO of Castar Applications, Inc.
4 Thomas was raised in the Appalachia Straight region of Virginia. 5 Brother of Seattle Seahawks running back Julius Jones. 6 Attended Powell Valley High School in Big Stone Gap, Virginia. 7 Graduated from the University of Virginia in 3 years. 8 Selected by the Arizona Cardinals in the 1st Round (7th pick overall) of the 2000 NFL Draft. 9 NFL running back for 12 seasons.